Hotty Toddy Lotty Doddy | Grove Gameday Services - Household Management - Catering and more! Hotty Toddy Lotty Doddy provides everything for the ultimate Ole Miss gameday tailgating experience. We provide tents, tables, chairs, coolers, and anything else you request to make your tailgate hassle-free. We handle the setup, the clean up and the dreaded take down of equipment. No storing your gear, sitting in traffic to unload and load back up after the game. We are here to take the hassle out of your Grove experience. 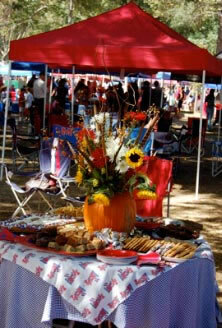 With our services, you can devote more time to enjoying your Ole Miss gameday in The Grove. Get the Official Hotty Toddy Lotty Doddy Grove Tailgating Cookbook! Copyright © 2009 Hotty Toddy Lotty Doddy. All Rights Reserved.